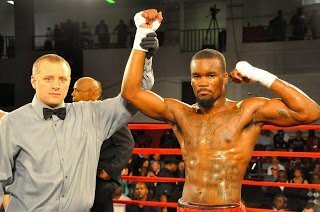 Fast rising prospect Jerry “The King’s Son “Odom took time to give an exclusive interview to Fightnews. The 20 year old from Bowie, Maryland has had five fights since his pro debut in October 2012. In a manner reminiscent of young Mike Tyson’s early rise all five have ended within the first round. Total ring time in five fights being 6 minutes 23 seconds. Odom has risen from a troubled youth in the Paradise projects of Washington D.C. to a Golden Gloves champion. At 14, he stood in a D.C. courtroom in front of a judge he knew was tired of seeing him. It was Jerry’s third time there. . The youngster was looking at serious time. His uncle proposed a last-ditch solution: He would take Jerry. Ken Williams, a home builder, asked the judge to let Jerry live with him and his parents in Bowie. It is in this environment that Jerry received the opportunity to turn his life around. He has fully grasped this opportunity. The super middleweight has drawn a lot of attention from community for his natural knockout punching power. He has recently signed with GH3 Promotions and is scheduled to fight September 13th at Newark’s Robert Treat Hotel in his first bout outside of the D.C. area. Q-I’ve found conflicting information on the Internet regarding your amateur career. One that you had won at 201 pounds National Golden Gloves Tournament of Champions in Mesquite, Nev. Another had you fighting from 2009 to 2012 at 178 lbs. What can you tell me to clarify your amateur record? Q-You didn’t go on to the Olympics. A-No I fought for the Olympics twice. The first time I fought something had happened and they wanted to redo the trials all over again. And then I lost and placed third. Q-What made you drop to 168? You’re young and growing how long do you plan on staying at 168 lbs.? A-I knew that I could do it. If you do it correctly you can drop that weight. And I don’t have to do like in the amateurs and weigh every other day. It was no problem to get down to 168 and still be strong. I’ll stay at 168 as long as my body allows me to. Q-What or who got you interested in taking up the sport? Q-Is Uncle Ken your trainer? Q-In the time span from your pro debut on October 27, 2012 to your last fight on May 15, 2013 you have had 5 fights. One ended in 16 seconds the result of a clash of heads and was ruled a No Contest. The other 4 were all 1st round knockouts. I added up your total time and so far you have had 6 minutes and 23 seconds ring action in 5 fights. Can you comment to me about this? A- When I do my due diligence outside of the ring then the good things will come. Especially when you take the sport as seriously as I do. Everything shows in the ring of what you do behind the curtain. I know how to handle my business. I have a gift given by God. When I step in the ring it is just not me in the ring. It is me and the God I serve and we handle business together. Q-Will you wait for him see how you do with other opposition in four rounders to test yourself at actually going the four round distances or if the knockout streak continues at some point will you just take the next step up to six rounds? A-I am only doing one more four round fight and then I and stepping up to six. And I don’t see any problem because I train hard and push myself in the gym. So when I run into a fighter that is going to last all of the rounds I’ll also be able to. Tell me about your training routine? In the morning I run. I go to the pool every other day for strength and conditioning. Then I go to the gym every day. Basically I work out the whole day. Your dynamic start in the pros reminds me of Mike Tyson’s start. What boxers do you admire or try to be like? In 2010, Theresa Vargas of the Washington Post wrote an excellent article detailing your young years that were very turbulent. Would you want to comment on this part of your early life? As your success and name recognition grow you could be a very positive influence on other youngsters growing up hard. Have you given any thought to this? Q-Your ring nickname “The King’s Son”, what does that signify? A-That I am God’s child and together with him. Q-Besides boxing what are your other interests? A-In my off time I just chill out with my family, play some basketball. This is my first semester in school at Full Sail University. My major is communications. Q-Last item open mike for you, anything you want to say to the public? A-I don’t call them fans I call them supporters without them I could not go far. I want to thank them for pulling for me this long.